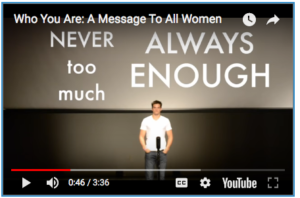 Woman, are you enough? Are you awesome? When are you going to unlock your potential and change the world? (Actually, Ezekiel 28 describes Lucifer with that same stunning beauty.) When that viral video, “Who You Are” went around a few years ago, I had friends who actually wept tears of joy over this, and shared it with their daughters. With sappy music and heart-tugging “raw-ness,” the performer shows us just how Satan still whispers to us about our own stunning awesomeness. Good grief! We are not awesome, and we are NOT enough. But Christ is. See, when we take our eyes off Him and place them on ourselves we are sinning. “I am absolutely weary of some of the memes aimed at Christian women these days. You know the ones I mean, ladies- the ones with lovely pictures of flowers or an ocean or a meadow with a superimposed flowing script practically BEGGING us to believe how much worth we have to God, how awesome we are, how we need to discover the greatness within, how God gives us limitless potential and a superfantastic divine purpose, blah, blah, blah.